Volleyball Strength | How to Become a Strong Player? How to Gain Volleyball Strength? 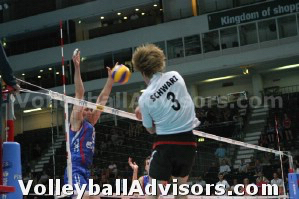 To a certain extend the player is able to gain volleyball strength just by playing. You must have heard a phrase "getting into shape by playing." Beyond that an athlete can increase strength i.e. with own body weight training - with various plyometrics exercises (jumps, hops..). It doesn't necessarily mean traditional weight lifting - very light weighted training can be done with medicine ball exercises and kettlebell training. Increasing volleyball strength by weight training and conditioning by weights is necessary and absolutely appropriate training method also for junior and female volleyball athletes. Why a volleyball player should do weight training? With body weight exercises only, some day an athlete will run into a wall and is not able to develop anymore. Strength training by weights doesn’t take very much time: 30-60 minutes three times a week makes a difference. There are several different ways to train volleyball strength: for example kettle ball training or medicine ball training in addition to traditional weight lifting. Squats, step ups, hang cleans, snatches are GREAT ways to increase the vertical: those movements work out the whole muscle chain (legs, core..). They include a powerful hip extension and develop important core strength. Weight training can be introduced to 15-16 year olds, both males and females. However, weight training at those younger ages needs to be done with lower loads and intensities. At younger ages athletes should only use medicine ball and kettle bell training - or traditional weight lifting with lower loads. Lift with 0 - 30% of 1 RM, (1 RM=the maximum weight you can lift). This means the weight you'll be using should be 0-30% of the amount you can lift with one repetition. So you'll be just learning the techniques first - with no weights at all - and when you have the proper techniques, you'll be gradually increasing the loads up to 30%. 17-18 year old athlete could be ready for the traditional weight lifting with higher, close to the maximum weights (85 - 100% of 1RM), if the techniques have learned and an athlete has minimum of 3 month extensive strength training behind (with 70-85% of 1 RM). To conclude - How to progress with weight lifting? An athlete starts with no weights by learning techniques. And adds weights little by little over time up to 30% - to learn the techniques perfectly. When the proper techniques have been learned (it can take months), an athlete can move into the higher 70-85% loads. There is some controversy about importance of strength training for women. For us the subject of women's weight training and conditioning is very clear. Women should be encouraged to do weight training also; the physical elements of women are not that much different from the men. There is no reason why weight training or weight lifting would not be beneficial to female volleyball players. Women’s muscles work just like male muscles; they are absolutely able to get stronger and lift an athlete higher, just like male muscles. Women Play with Speed - not with Power!?! We have heard often how women’s volleyball is different from men’s volleyball; women’s game focuses more on the speed and quickness while males play with the power. That can be true to some extend, but we all still play the same sport, which means the training should be very similar. Female volleyball players - break the myths and start gaining power with weight training!! If you got more interested in volleyball weight training, introduce yourself to the basics of strength training at the following link. You find medicine ball training, plyometrics, etc.